First run in 1974—and originally called the Niagara Skylon International Marathon—Niagara Falls is one of only a few running events in the world to start in one country and finish in another. The event attracted more than 3,000 runners in 1976 which was more than both New York City and Boston had that year. A year later, it was renamed the Skylon International Marathon and continued on as such for a number of years. The storied race also played host to two U.S. men’s Olympic marathon trials in 1980 and 1984, when the unofficial course record of 2:10:19 was set by American Anthony Sandoval. Peter Pfitzinger of the United States holds the official (non-Olympic Trials) record of 2:17:10, set in 1980. The current women’s course record of 2:37:08 was set in 2004 by Canadian Nicole Stevenson. Due to sponsorship issues, the name of the event was changed to the Buffalo Niagara Falls International Marathon between 1983 and 1986, after which the event did not take place for a number of years. However, around the same time, the Buffalo Marathon was established and takes place to this day in late May. The Niagara Falls Marathon was revived in 1997 and was called the Casino Niagara International Marathon from 1998 to 2008. A half-marathon race was added in 2001 to attract a larger field. In 2006, the course was changed slightly so as to finish at the brink of the falls and in 2009 the race was renamed to what it is known today: the Niagara Falls International Marathon. The most recent course change came in 2012 and now features less time on the American side of the border and more of Fort Erie and the Niagara Parkway. Only the marathon event offers a truly international experience and now hosts about 1,000 participants every year. Although rare, Niagara Falls isn’t the only event to cross international borders. The Bay of Fundy International Marathon takes place in mid-June and starts at the easternmost point in the continental United States at West Quoddy Head, Maine. It crosses the border into Canada and runs the entire length of Campobello Island, New Brunswick before finishing on the waterfront of Lubec, Maine. The Detroit Marathon has participants cross into Canada via the Ambassador Bridge then travel alongside the Detroit River on Riverside Drive in Windsor before running through the Detroit-Windsor Tunnel back into the United States. The Sault International Festival of Races takes place in late September in Sault Ste. Marie, Michigan and provides participants with the unique opportunity to traverse the Sault Ste. Marie International Bridge, crossing into Canada and then looping back into America for the finish. The YMCA International Bridge Race is a 10K event that begins in Port Huron, Mich. before crossing the Bluewater Bridge and finishing in Sarnia, Ont. Bay of Fundy International also has a cross-border half-marathon (starts in Canada and ends in the USA) and a cross border 52K Ultramarathon (starts and ends in the USA with half in Canada). Maine and New Brunswick also share the Johnson’s 5 mile international road race in Calais, Maine and Saint Stephen, New Brunswick. good to see someone talking about this race! thanks. I was surprised however to not see a great deal about the real history of this race. I was a kid in the 70s when this race had some very big names. Jerome Drayton for one! My father (William (Bill) Beattie) ran this race and if I am correct, this is where he had his PB of 2:31. I recall being there for the race and seeing Drayton running. I can’t recall who won that year or which year it was but I know it was called the Skylon International at the time. Funny this story is what I am reading right now after getting back from a trip to relocate my aging parents as my father had become ill. I was reminiscing about the trips to various city marathons in the 70s and 80s and this race was one in particular. I wish the race committee or Athletics Canada would put together a concise history of these races including times. We have much of this these days with electric timing but what about the historical stuff! Fergus, William Beattie ran the Skylon on 10/21/78 and perhaps others. I will see if I can locate the PR year if he ran it more than once in the ’70s. You’re right, though…this marathon has a rich history and rest assured it will be preserved in the years to come. So glad it’s part of your family’s history as well! Correction to this article: The Skylon International Marathon did not become the Buffalo Marathon. 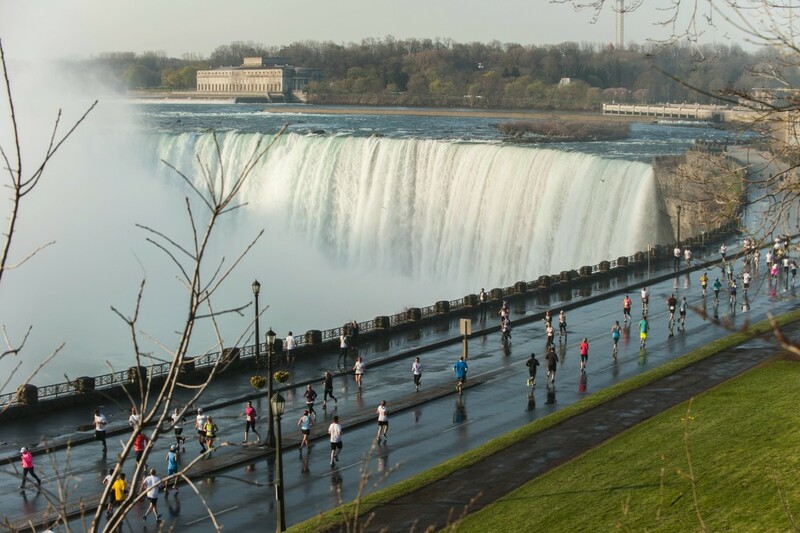 The Skylon Marathon (and the visionaries who created it) paved the way for what is now known as the Niagara Falls International Marathon.